This article contains affiliated links, we may receive a small commission if you purchase products through them (it costs the same while the commission will support us to run the website and develop future contents. Thank you for your support and happy browsing. I always love tartan scarf but too lazy to do all the color changing while knitting or corcheting. However, when the planned color pooling tartan scarf became a phenomenon in the crochet world lately, I decided to give it a try. Well, I didn’t just I give it a try, it was more like 10 tries to get it started right, then another 10 tries of crocheting and ripping half the scarf apart and restarting. 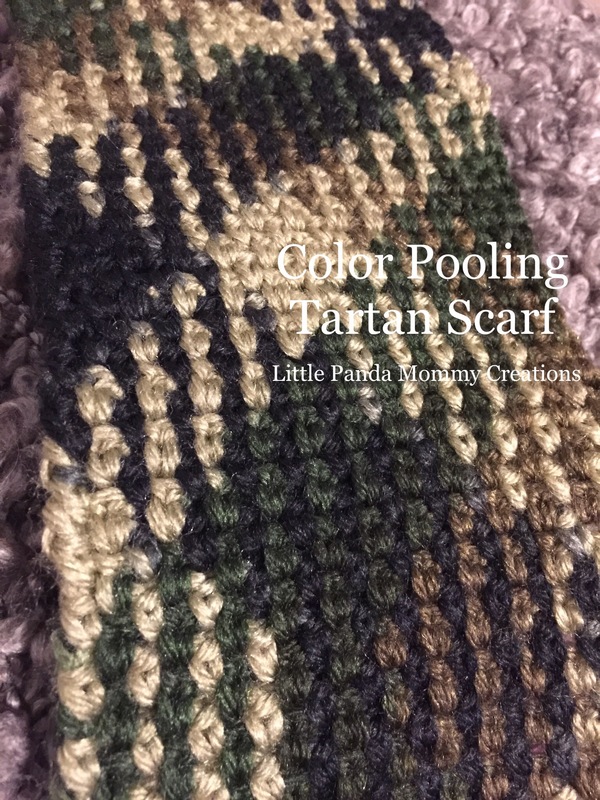 Even though it was frustrating how it worked for 10 rows and showed the tartan pattern then suddenly went bananas on me, I am glad to finally crossed the tartan scarf and color pooling off from my to-do list. 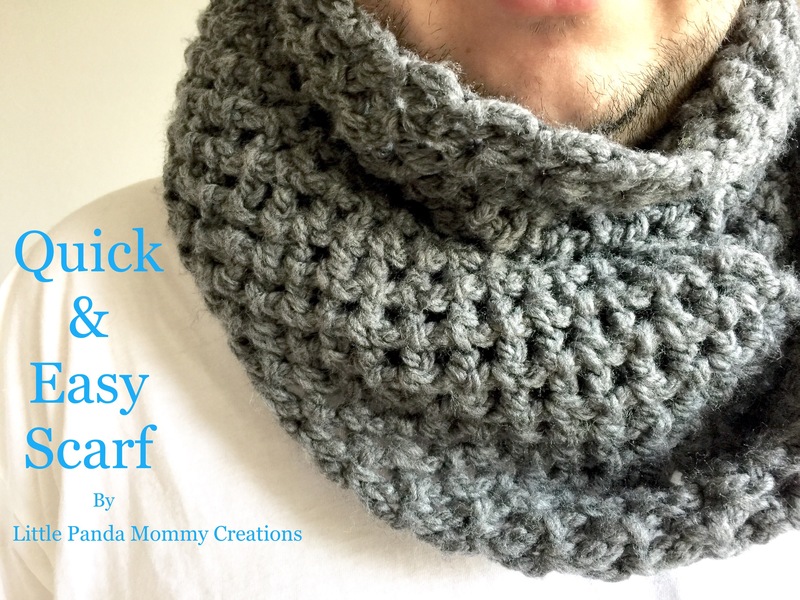 After all the intense practices for single crochet and chain stitch, this scarf was made with crochet moss stitch, also known as granite stitch. 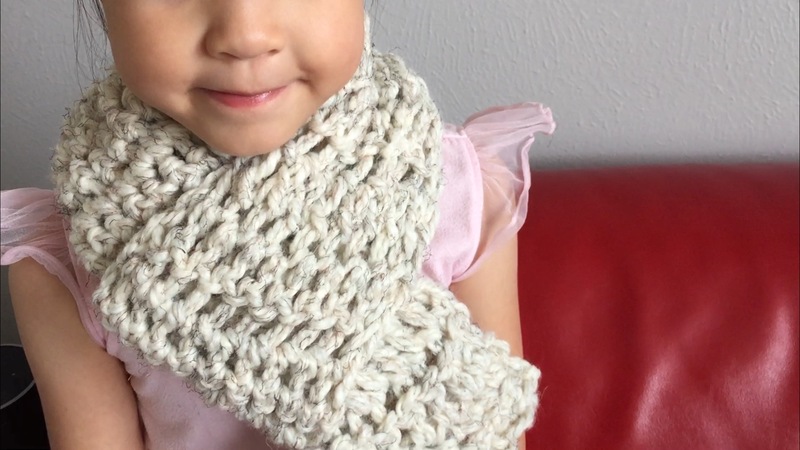 How to make moss stitch? Cast on multiple of 2 (mine was 24). Row 1: Sc into the 4th st, * sk 1 ch, ch 1, sc into the next ch. Repeat * to end. Turn. Row 2 to end: Ch 2, sk 1 st, sc into next ch 1 sp, *ch 1, sk 1 st, sc into next ch 1 sp. Repeat * to end. Turn. I found a few tips to share with you if you wanna give it a try or more than a few tries. For materials, you need some variegated yarn and the suggested size hook (probably a few smaller size hooks also). 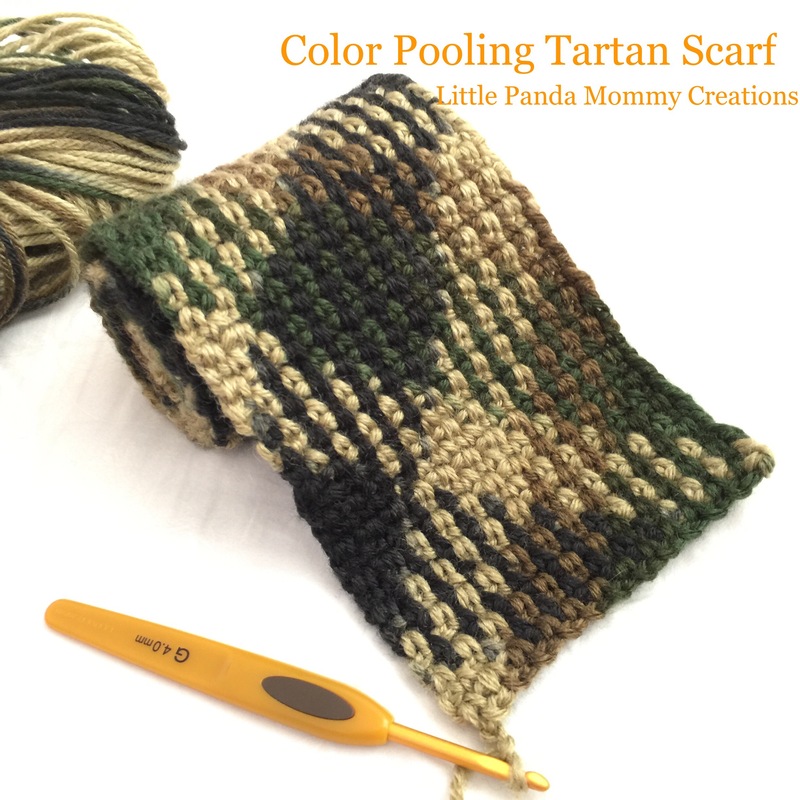 I used Red Heart Super Saver yarn in Camouflage colorway with a 4mm hook. To get started , casted on 24-36 stitches. I tried 24, 28, 36 and after switching hooks from a size 5mm hook to 4.5mm to 4.25mm, I finally got it worked with a 4mm and chain 24 cast on combination. 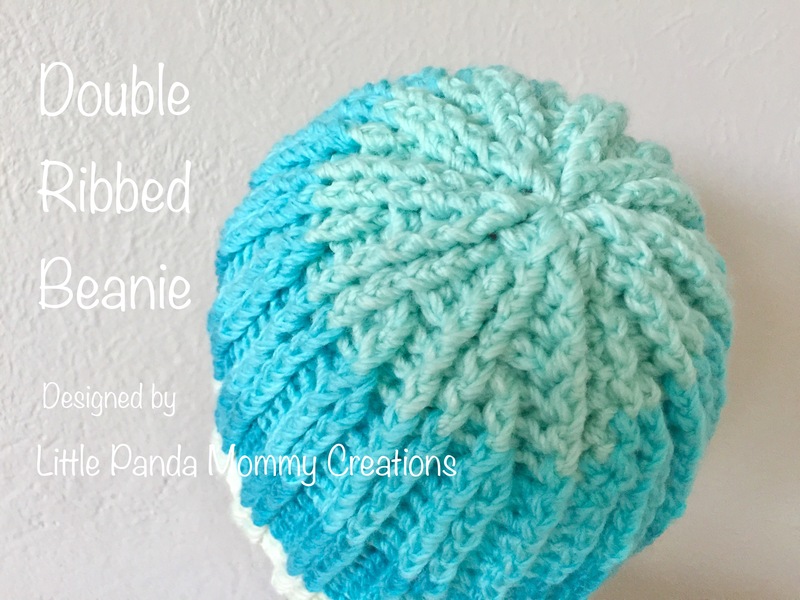 If the color pooling is working, you should notice the tartan pattern start to show about 2- 3 inches length, be careful because it could work it way out of alignment if your tension changed just the slightest bit, then the once beautiful tartan pattern would be gone and you will be wondering what is wrong. 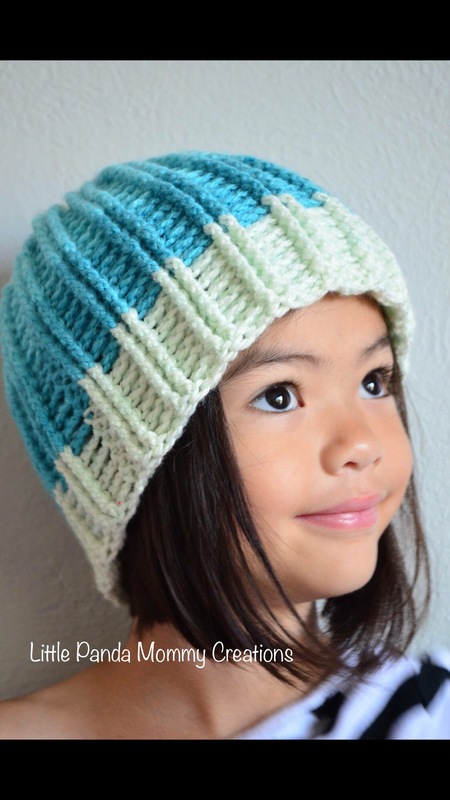 I almost fell for the white lies my husband kept telling me: “it was the yarn, not you. It just wasn’t the right kind of yarn.” However, I am stubborn and couldn’t hide from the fact that there were two perfect tartan patterns on the scarf. 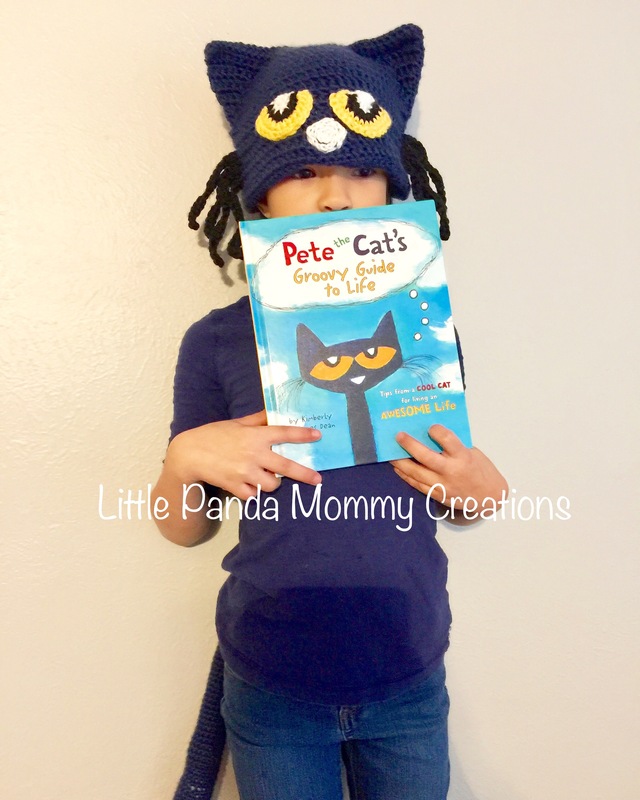 Lesson learned, if you are going to pick up and put down the project a lot like I do, as a busy mom with a baby and two school aged girls, 2 dogs that are getting old and need to go outside every 2 minutes, you will need to re-adjust every now and then as you go. 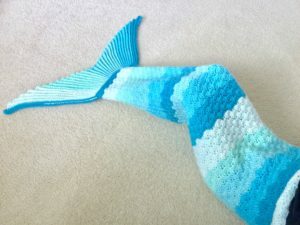 Or try your best to find some uninterrupted time to sit and crochet, therefore you will have a better chance to keep the tension precise and consistent. 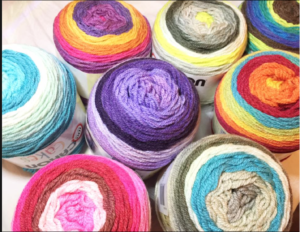 Tension plays a key role in color pooling. 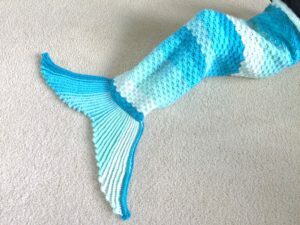 This scarf you see now made with the same hook same yarn but had been unraveled multiple times. It wasn’t fun and super confusing as I looked at the scarf when it went wrong, it had the perfect tartan pattern for 5 inches long and all a sudden it looked nothing like tartan, not even remotely have the possibility to be tartan in anyway. Somehow my stubbornness won and I unraveled the same messed up part for 3 more times and magically it became tartan again. I was so mad at the crazy rows (at least 15, if not 20 rows) I didn’t have the heart to took a picture last night (I really should have). I just unraveled it and left it there for another tryout this morning. Thanks God, it worked. If time available, I will make a Skillshare class about how to spot a mistake while color pooling and how to fix it before you need to rip apart half the scarf. Subscribe by email to my blog or follow me on facebook and Intragram to receive update. 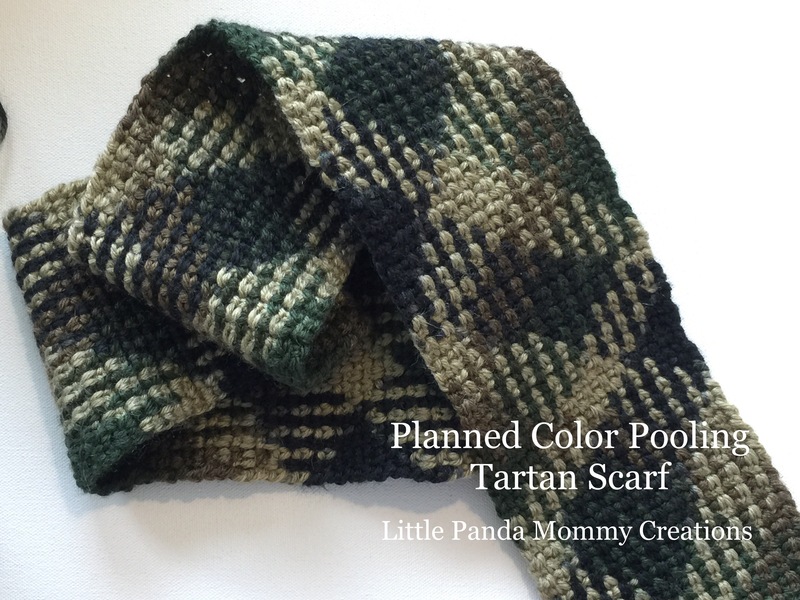 This entry was posted in Crafts 手作仔, Creations, Crochet and tagged Crafts, Creations, crochet, diy, fiber arts, granite stitch, handmade, littlepandamommy, moss stitch, planned color pooling, scarf, tartan on September 28, 2016 by littlepandamommy. 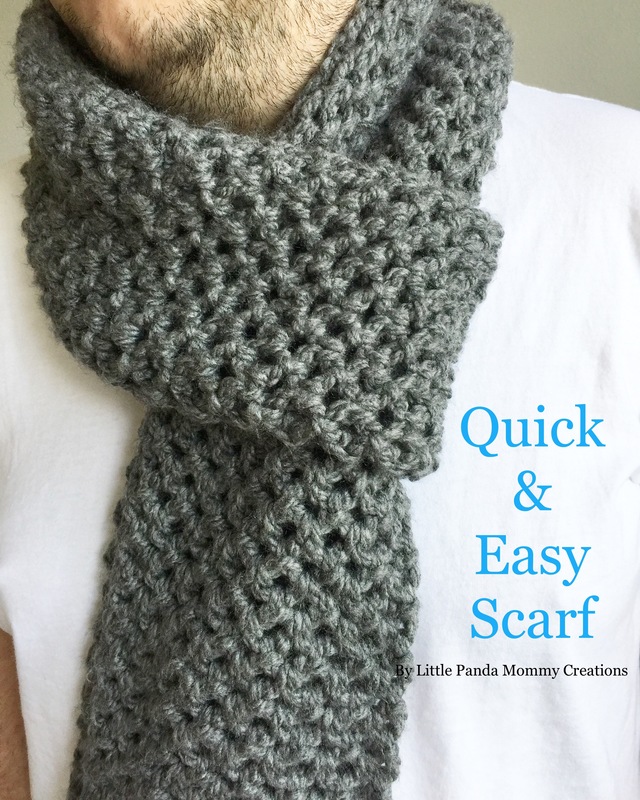 After weeks of planning, filming and editing, my first class “Simply Crochet – Finger Crochet Scarf” is finally published. In this class, I will teach you how to crochet with finger, no hook needed. It was a quick and easy project. Super bulky yarn was used and you know it means this shouldn’t take long to finish. Join my class by clicking here. Use this link and you will get 3 months of Skillshare Premium for only $0.99 for unlimited access to this and thousands of online classes. 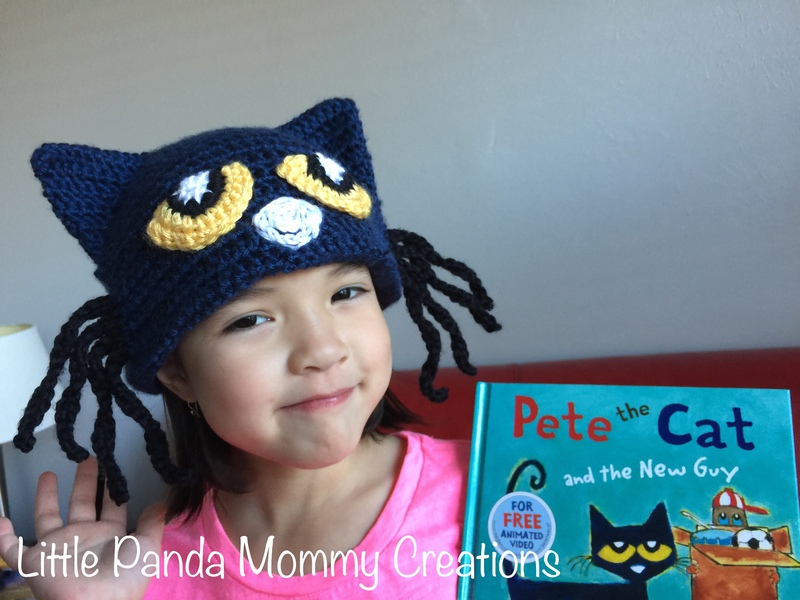 In this class, students will learn the basic of crochet. 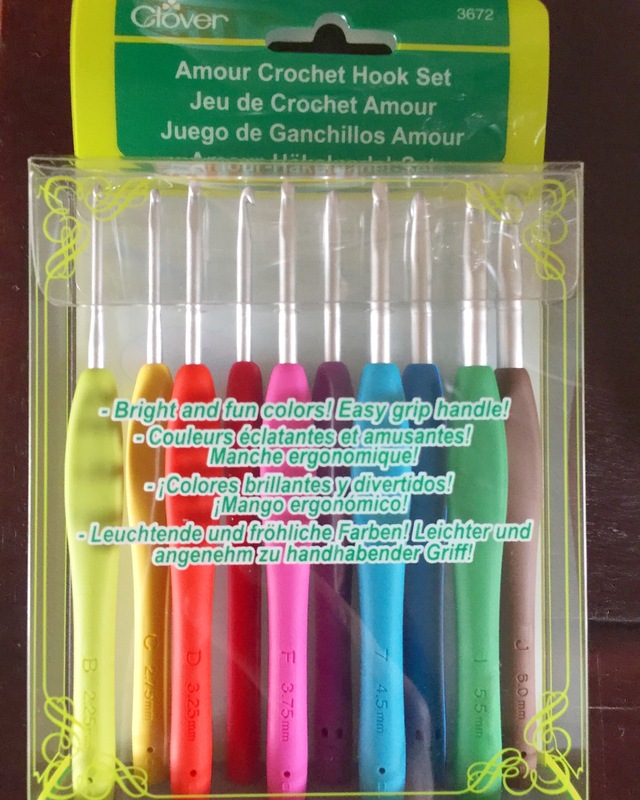 Instead of using a crochet hook, they will learn how to use fingers to crochet. 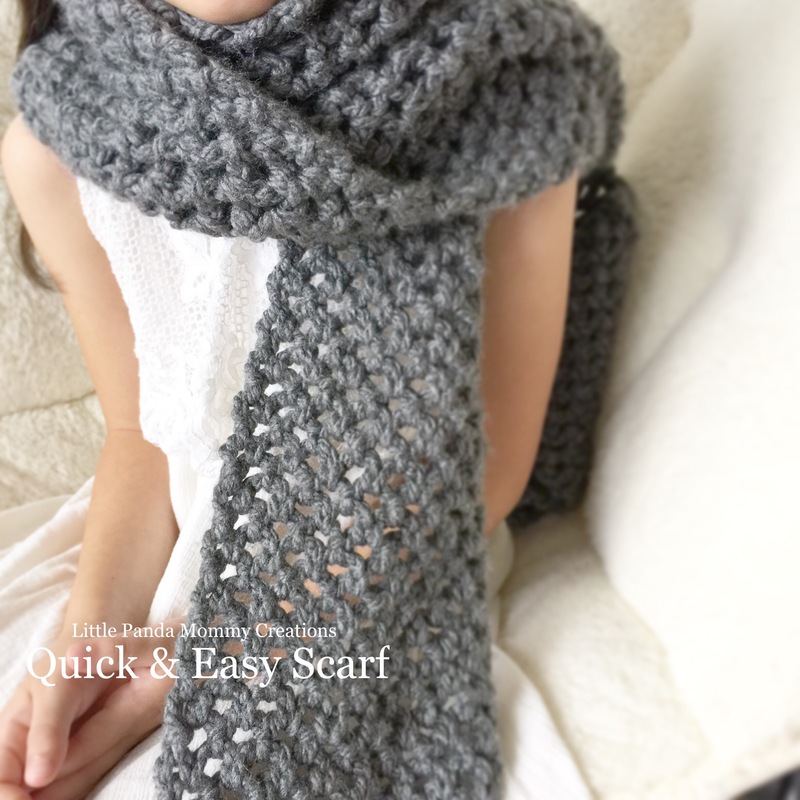 By the end of the class, students will acquired the skills to make a scarf. They are encouraged to share they finished assignments on class discussion board and social media. I can’t believe I will teach one day, it just never occurred to me. This happened because Skillshare contacted me out of the blue. I was approached by some brands, marketing agents and companies before, all about wanting me to promote their products on my social media. I only did it once and I am not going to do it again. However, I did agreed to write recipes for a parenting website that I visit regularly. After I looked into the Skillshare online learning platform, I decided to give a try. When I was told that I need to present in front of a camera, the class will be available online and needed to be taught in English (which is not my 1st language), it just added that much more to this unforeseen and impossible opportunity. I finished the challenge and I am planning to teach more classes in the near future. 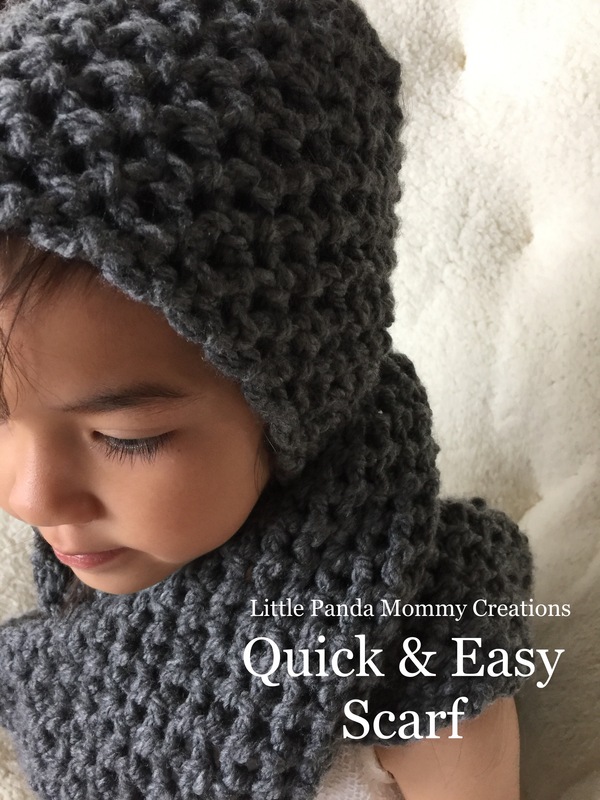 This entry was posted in Crafts 手作仔, Creations, Crochet and tagged Crafts, crochet, handmade, online class, scarf, skillshare on September 20, 2016 by littlepandamommy.